When more information becomes available it will be here on KI. The Online Only Pet available this Saturday is the Grey Wolf. The available charms are the Black & White Cat and the Pig. The "extra" items available are the Zingoz Tree, the High-End Sandwich Maker, the Rewind Retro Sectional and Rewind Retro Expansion Set. 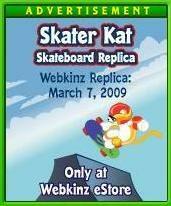 Today's Webkinz Wednesday at the eStore features the Phoenix and the Purple Floral Fox. This is the first time that the Phoenix has been sold in the eStore. Also one of our moderators, GrannyJeff is sure to be happy today to find out the Purple Floral Fox is up for sale. So make sure if you are interested in buying one of these 2 pets they are only for sale for today. It is unknown if or when they will return again. This widget will redirect you to the Main KI Reference Pages. Once you have been redirected to one of the main pages you will then see a larger navigation bar up top to switch between all the other Reference Pages. April is looking like it is going to be a major release month. A release of this scale has not been seen since last Summer. As we have already announced Ganz is releasing 4 new pets for April and they are also releasing a line of Caring Valley Pets. In addition to these 2 product lines Ganz is also introducing Signature Pets and Kinz Klips. 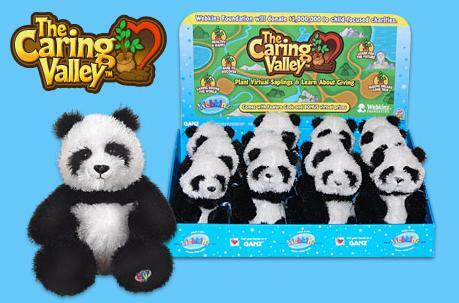 We can now bring you a little bit more information on Ganz "Caring Valley" Webkinz. It appears that Ganz is opening up a new feature in Webkinz World called the "Caring Valley" in which players will be able to "Plant Virtual Saplings & Learn About Giving". This is associated with the "Webkinz Foundation", a Ganz Charity which donates "funds to programs that benefit children". KI's front page has gone under a major transformation. There is now a new way to create Breaking Newz Articles. If you are a Reporter, Moderator or Administrator you can simply just post news in the Breaking Newz Forum as a new thread and it will automatically be posted on the front page. This eliminates kinzislandwetpaint.wordpress.com. It will offer an easier to use system. And it also allows for more safety for our members. you will need to be a registered user in order to post comments on these artciles which will keep anonymous users from posting. Check it out today. working hard and would like to officially announce it. pl086 asked me this question yesterday and I can now answer it. What is the new KI feature that is being released? 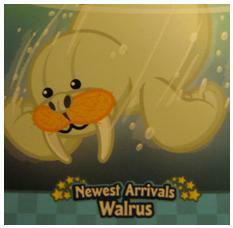 The POTMs for April and May 2009 have been announced on the Webkinz Retailers' Site . 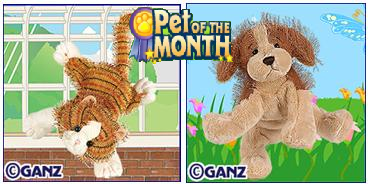 April's POTM will be the Webkinz Alley Cat (Large Size Only) and May's POTM will be the Webkinz Cocker Spaniel (Large Size Only).